If your sump pump isn't up to par, it can end up costing you. Even a small amount of water can cause major problems. A sump pump is designed to pump water through a discharge pipe and away from your home's foundation. When a sump pump fails, the result is often a flooded basement and expensive water damage. It doesn't take a lot of water to cause major problems. 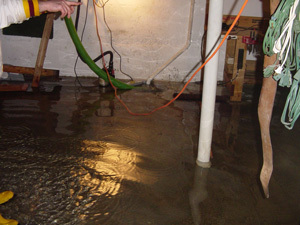 A small amount of standing water on your basement floor can quickly turn into a nasty mold problem. You don't have to wait until you have a wet basement to address your sump pump problems. It helps to understand common sump pump problems – and then avoid them by making smart sump pump choices. If your sump pump isn't the right size, it might not be able to handle high volumes of water, which can leave you with a flooded basement. Sometimes a single pump isn't enough. A sump pump can burn out because of a faulty float switch or an overworked, underpowered pump. Cheap pumps made with inexpensive materials and components are prone to failure, especially when they’re needed most during extremely wet weather. There are several reasons why a pump might lose power. It could be a tripped circuit breaker, unplugged pump or power outage. No matter what the reason, a normal sump pump doesn't function unless there's power. When the intake becomes clogged, this prevents the pump from extracting water from the sump pit or sump liner. The discharge pipe is what carries water from your sump pump to outside the home. The pipe can become clogged with dirt, rocks, roots and other debris. In the wintertime, any water in the discharge line can freeze and clog the system. 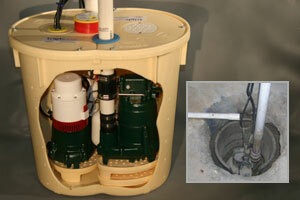 Three high-capacity pumps keep the TripleSafe system working long after standard sump pumps fail. Basement Systems has designed sump pump systems to overcome many of these common sump pump problems. All of the systems include cast-iron Zoeller pumps that are designed to reliably handle a variety of pumping needs. Other problem-solving features of our sump pumps include a patented pump stand that prevents sediment from clogging pump intakes, a jam-proof float valve and airtight sump cover. The optional IceGuard™ device helps prevent the discharge line from freezing. Our TripleSafe is a sump pump system engineered to function under extreme conditions that often overwhelm standard sump pumps. This system includes three pumps: a primary pump that does most of the pumping, a secondary pump that turns on if the primary pump fails and a battery backup pump that turns on if there's a power outage. A battery back-up, or emergency sump pump can be a lifesaver in the event of a power outage of any other situation where your sump pump isn't getting power. Contact Basement Systems today to schedule an appointment with your local contractor. They can evaluate your basement or crawl space and provide an estimate on installing a new sump pump system in your home.